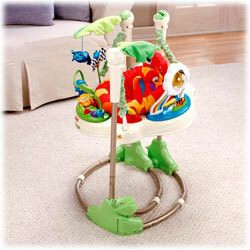 Everything your baby needs can be found in this Rainforest Jumperoo. Its newly designed frame allows you to opens it up from the top, and lets the seat rotate 360 degrees so baby can play and interact from any side. A fun seat and toys at five locations on the platform engage baby all the way around, and an electronic toy at the front has motion, music and lights that can be activated by baby spinning a drum. Seat also features a bobbling elephant, a monkey swinging from a vine, a parrot hanging from a bead bar, a clear spinning bead ball, a tiger that plays hide and seek, a spinning lizard that makes rattling sounds, a tethered chew toy and a stack of chips with cute graphics for baby to explore. Two soft leaves extend from the frame to create an overhead 'canopy' with soft toys that dangle down for fun bat-at play. 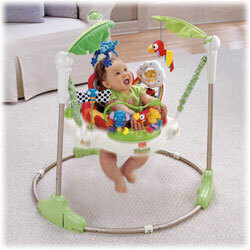 Jumperoo has has three height adjustments for extended use. Frame pivots to a nested position so it can be tucked away when not in use. Includes a motion sensor that encourages kids by rewarding them with lights and sounds when they jump. Weight Capacity is 25 pounds. Requires 3 "AA" batteries, not included. Measures 43.125"H x 32"W x 37"D.
Introduce baby to a place full of exciting sights and sounds and lots of safe jumping fun with the Fisher-Price Rainforest Jumperoo. Designed for use by a child who is able to hold his or her head up unassisted, and who is not yet able to climb out or walk, this baby jumper delights baby with interactive play options and stimulating movement to help encourage healthy development. The Rainforest Jumperoo is a safe and comfortable place for baby to sit and play, whether he stays for just a moment or for several minutes. Two soft leaves extend from the frame to create an overhead canopy with soft toys that dangle down for fun bat-at play. It also features a rotating seat with soft spring covers that keep little fingers safe from pinching, and three-position height adjustment for a custom fit. Little explorers will also enjoy playing with the Jumperoo's many animals and toys, including a bobbling elephant, a monkey swinging from a vine, a parrot hanging from a bead bar, a clear spinning bead ball, a tiger that plays hide and seek, a spinning lizard that makes rattling sounds, a tethered chew toy, and a stack of chips with eye-catching graphics for baby to explore. 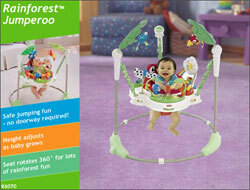 The Rainforest Jumperoo is designed to help encourage healthy development. Moving, spinning, and jumping in a baby jumper enhances large motor skills. Secondly, the variety of textures integrated into the rainforest toys provide tactile stimulation, while the bright colors and fun music engage your child's visual and auditory senses. This educational system also enhances learning through discovery; baby's actions make things happen, helping him to understand cause and effect. Finally, reaching and grasping onto the baby jumper's toys fosters eye-hand coordination. Parents will appreciate the quick take-down and portability of the Rainforest Jumperoo--the frame pivots to a nested position so it can be tucked away when not in use, and it simply folds so you can carry it from room to room. And no doorway is required to use this toy, making it a breeze to set it up anywhere. The Rainforest Jumperoo includes a motion sensor that encourages kids by rewarding them with lights and sounds when they jump, has a weight capacity of 25 pounds and maximum height 32 inches, and requires three "AA" batteries (not included). It also measures 32.0 x 43.125 x 37 inches (WxHxD). 6 month old LOVES this! I purchased this 2 wks ago for my 6 month old and he loves jumping in it! He's about 25inches so we set it to level 1. His toes barely touched the floor when we put him in it so we just put a small blanket under. Lifesaver and a Godsend !! We bought this Jumperoo for my son when he was about 4 months old. It was very easy to assemble - my 8 year old son saw to that part. For my other three children, we used the type that hangs out of the door frame. That was also a lifesaver and this works very much on the same principal however is more of an interactive " playstation" as I would refer to it. He absolutely LOVED it from day one. In the beginning, we would have to swivel the seat around ourselves when he had enough of one certain toy. That was and is not a problem, because now at 5 months and 2 weeks he can do it all by himself. I also put a small little mat under his feet cos he cannot quite reach the floor to jump up and down but now is also not a problem, he can do it by himself. What I thought might be a bit of a white elephant or non starter was the bee that flops. He actually loves it and into the mouth it goes and when its not in the mouth he has it between his little fingers. He LOVES that bee. This Jumperoo gets me at least 20 mins peace and quiet at any given time. It is safe and the little tunes do not get on your nerves the way many tunes and melodies can do. He cries when he has had enough and out he comes, easy. My other three children, 13, 11 and 8 years get great enjoyment out of watching him jump up and down and of course they jump beside him also and in turn makes him want to jump and giggle more. I splurged on this for our third baby because I was bored with our old baby stuff. I have no idea why I didn't request this in 2005 when we had our first child; Jumperoos were around then. It is by far the best baby item I have ever owned. My six-month-old can actually stay in it happy and giggling for up to an hour. The VERY BEST toy we ever bought for our baby!!! I saw this Jumperoo at a second hand store and thought it looked kind of cool and I'd heard that babies like them. I wanted to get it, however was concerned that we already had so many toys and similar items in our house. Our house was just filled with baby stuff and I knew my husband would not be thrilled if I brought it home. However, I decided to try it anyway. I brought it home and like I thought, husband was not thrilled at all. "Another TOY?!?!?" And a big one too! We put our son Benjamin in it when he just started to hold his head up fully, we put a towel in the front to hold him in better, and the back of the seat has a great head rest/neck rest for when babies are still a little wobbly. He loved this thing more than any other toy, he'd sit in it for 45 minutes if we'd let him, jumping and jumping. It made my life so much easier because I could put him in it and go get things done, or dare I say, relax with hubby a little, while baby is having tons of fun jumping! The one and only annoying thing about this product is that it is a bit of a hassle to move between rooms, because the base is wider than a door, so it has to be taken a part to move it to another room, however according to the picture above, they make it look pretty simple, so I may just be doing it totally wrong. Oh, and it's pretty heavy... but both of those things have to be that way to keep it safe and sturdy so as not to flip over. This has been the best toy/ activity center my son could have. He is now six months old and he has been playing on it for little more than 2 months. He keeps finding new ways to play with its toys and is occupied most of the time. Right now he is in the jumping mode and jumps for more than 15 minutes continuously. We have it our kitchen/dinning room and I am able to get my work done/ eat lunch and dinner while he jumps on it. Usually my son does not play for more than 10 mins without me by his side but the jumperoo really helps keep him busy. I am sure most parents will identify with that. We have tried the excersaucer at our friends place and my son got bored with it within five minutes. So we are really glad we went with this product. Also gives him a good workout. My child really seems to think that this is the greatest invention ever. She has so much fun in it, I wish I had one for myself. She took almost 2 months to warm up to it- at first it was more like a "dangle-roo" as she just sort of hung in the seat with her legs scrunched up, but eventually she began playing with the toys, turning in the seat, and one night she just started jumping! Ever since that, we can't live without it. She actually uses her walker to get over to the jumperoo and tries to play with the jumperoo toys from inside of the walker. When the jumperoo first arrived, we were unable to assemble it correctly because the metal pieces were not all the same size. We called customer service, they were very nice and helpful, and sent a new part quickly- still the wrong size, but slightly better. We have to pretty much force it to go together when setting it up, but this does not come close to keeping me from rating this 5 stars. My 3 months 2 weeks old baby boy loves it! I thoroughly researched exersaucers and jumpers before purchasing this one. This was the best (and most heavily) reviewed jumper/exersaucer despite its relatively low price. My baby is 7 months old and has been enjoying this jumper for the past 3 months. He loves it! From the minute I placed him in it he knew exactly what to do. The toys on it are just right, not too overwhelming. He's gradually learned to rotate himself in it and it amazes me how he never seems to bore from playing with the same toys. Best baby item I ever bought! This is a great toy, my son absolutely loves it. Plus it keeps him in one spot so we can do things around the house. It's easy to clean, too, which is a plus. I was hesitant, but baby loves it! Our baby LOVES this jumperoo! We got this as a shower gift and our daughter LOVED it. She out grew it quickly because she's tall but still she had a great time jumping around in it when she could.